It is both amusing and depressing to read the passages that Sokal and Bricmont analyze. There is no doubt that theorists such as Kristeva, Irigaray, and Baudrillard are brilliant and have had some things to say. Yet they clearly also allow themselves to articulate a whole lot of nonsense and, only slightly better, a lot of ill-expressed, unclear banalities. One is reminded of a statement from the preface of Wittgenstein’s Tractatus Logico-Philosophicus: “What can be said at all can be said clearly, and what we cannot talk about we must pass over in silence” (3). I was also reminded of the following video, which I will post in lieu of quoting passages from, say, Lacan that the authors expose as meaningless, passages which you can read by picking up the book. The most helpful section (as opposed to most interesting or most amusing) is the authors’ epilogue where they ponder some of the problems plaguing postmodernism and speculate about possible causes. They draw seven lessons from the texts they so thoroughly discredit in their book. 1. It is a good idea to know what one is talking about. One does not have to be an expert, specialist, or professor in a field or even a related field, but one cannot speak out of ignorance. When Lacan tried to relate topology to psychoanalysis, it is clear he had only elementary understanding of topology—and probably no idea about how to relate it even metaphorically to psychoanalysis. 2. Not all that is obscure is necessarily profound. And those who hide behind the façade of profundity betray their lack of both profundity and knowledge. 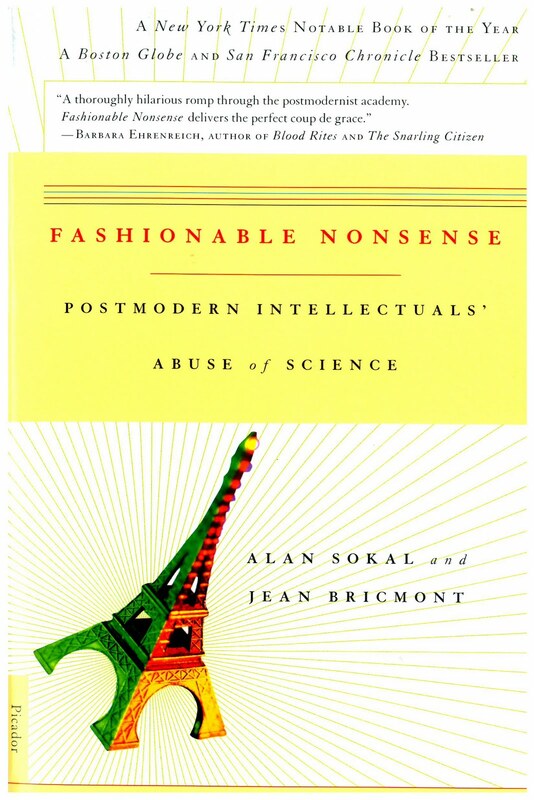 Sokal and Bricmont make a helpful distinction between “discourses that are difficult because of the inherent nature of their subject and those whose vacuity or banality is carefully hidden behind deliberately obscure prose” (186). For what it’s worth, this point along with number 5 below is one of the worst legacies of poststructuralism, and a laughable defense of it at times. 3. Science is not a “text.” That is, scientific ideas are much more than mere “metaphors ready to be used in the human sciences” (187). Treating them otherwise betrays that one does not know what one is talking about and moves us all the way back to the first point. 4. Don’t ape the natural sciences. The authors point out that the natural sciences have their own problems and methodologies that do not necessarily transfer to the humanities. 5. Be wary of argument from authority. Arguing from authority is related to the second point above. Deleuze is often obscure. But well-known, so he has authority. Yet in the passages cited by Sokal and Bricmont he (with Guattari) is rarely logical and certainly not profound. 6. Specific skepticism should not be confused with radical skepticism. The former is questioning one theory; the latter is questioning everything (saying, for example, that science is nothing but a social and linguistic construct). 7. Ambiguity is subterfuge. This is the closest the authors allow themselves to get at judging the motives and intentions of the authors they critique. They say, “We cannot help thinking that, in many cases, these ambiguities [in the texts analyzed misusing/misunderstanding scientific terminology] are deliberate” (189). In the chapter on Virilio, the authors also briefly speculated about motives, which to me is actually the most interesting and important aspect of the work though the authors say it is of marginal interest for them. In discussing a nonsensical paragraph about acceleration and society from Virilio’s work La vitesse de libération, they write, “We find it incredible that Virilio could consciously copy a sentence that he manifestly does not understand, add to it a completely arbitrary comment, and still be taken seriously by editors, commentators, and readers” (172). That is what baffles a lot of people. How do people like Virilio—again, people who do have something to say—completely dupe hosts of intelligent “editors, commentators, and readers” with meaningless theorizing? And why do they do it? No one quite knows I suppose, but read the book and you may have some very strong suspicions. Trolling my way through a couple posts on your blog... You gotta read Frame's book on epistemology, the Doctrine of the Knowledge of God. I know you're not taking sides so much as describing what the authors of this book say, but reading their enumerated points reminds me of how very much Frame has helped me. I feel I now better know the place of an argument from authority and better understand what it means to view science as in any respect a text. Thanks for the reading suggestion, Mark. I just went and checked Doctrine of the Knowledge of God out of the library. Do you have a one-sentence (longer is fine too) summary/review of Frame's book?